With up to 65% more fishable area than comparably-sized, comparably-priced shelters, the Wide House delivers roomy comfort than can only be described as presidential. It's ready to fish, in a portable, easy-up package! Setup footprint: 75" x 75"
Overal Dimensions: 84" x 84" x 68"h.
Fishable Area: 39 sq. 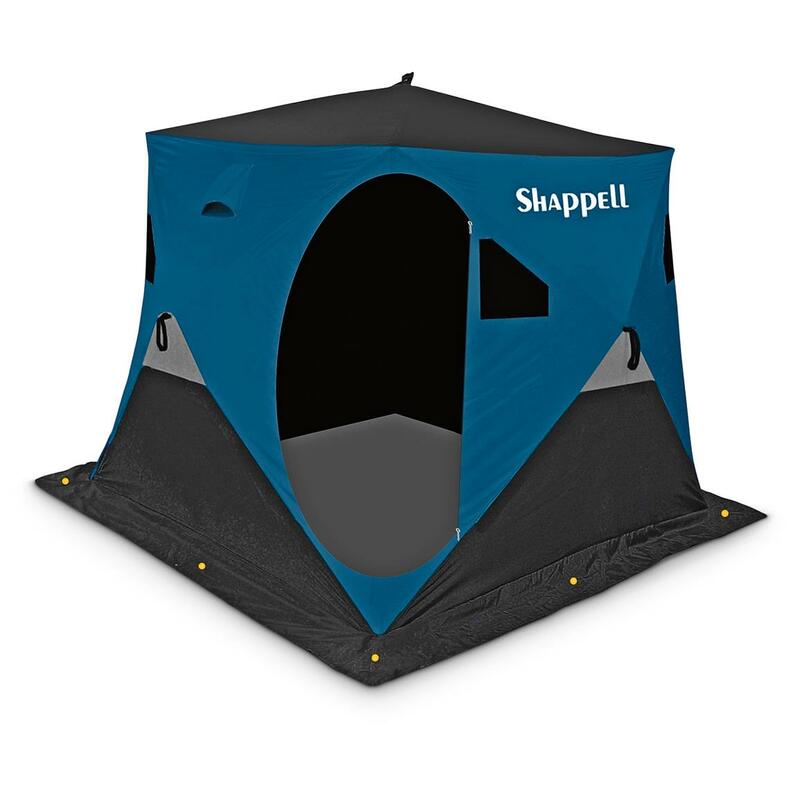 ft.
Shappell Wide House 5500 Ice Fishing Shelter is rated 4.7 out of 5 by 18. Rated 5 out of 5 by JMUPNORTH from Quality, Great Value, Excellent Customer Service. Another great product from Eagle Claw Shappell. 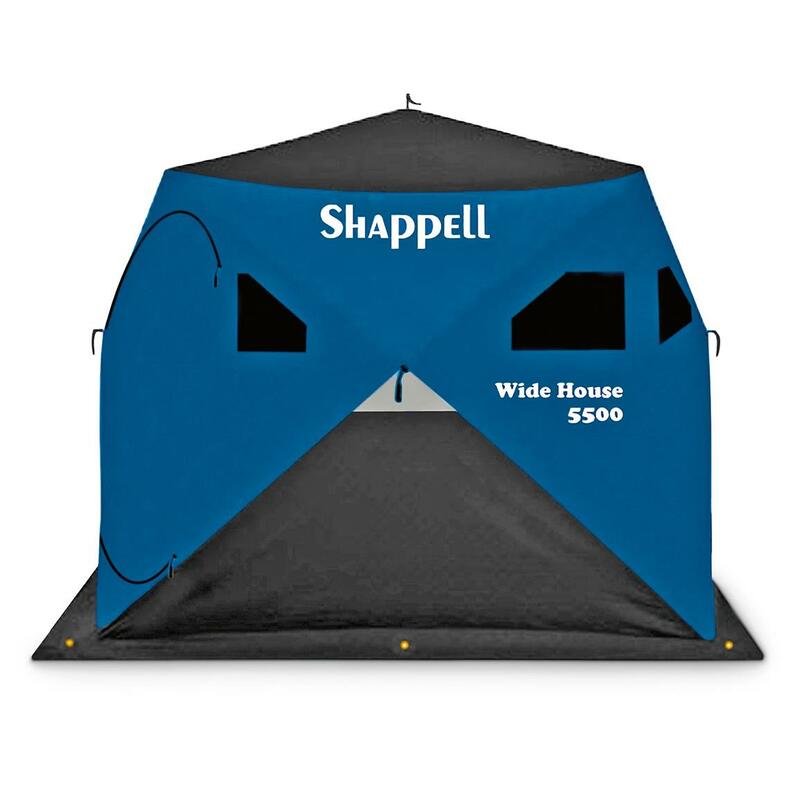 I must admit that after purchasing the Shappell FX 100 flip top shelter, and how satisfied I am, it was much easier purchasing the Wide House 5500 pop up shelter. Simply speaking it is an awesome comfortable two to three man shelter, and here is the reason why. The amount of windows and size of them allow one to keep a close eye on tip ups, and what is going on out side. The second most important feature is the double doors making it much easier to exit with two or three fishing in the shelter. No more climbing over gear or having your partner move upon exit or entry. Other great features include the 600D heavy duty fabric please note: the blue as shown in the net pictures is incorrect, the actual color is the typical dark blue same as all Shappell shelters, black roof to radiate heat, upper skirted venting, metal hubs, wide heavy duty grommeted outer skirts, are just a few of the great features of this unit. Setup out of the box couldn't be simpler, a couple of minutes or less , and you are ready to go. Taking down the same results, push in sides and top fold up and pack. Included is an actual canvas bag that is made of heavy duty canvas material, large outer zippered stake compartment, and oversized for easy packing not the typical thin flimsy Nylon. In the event you need replacement parts you will find Shappell to be the leader in fair pricing to their customers. This is an awesome looking, high quality unit that I gave it five stars, as I could not find anything that I did not like about the Wide House 5500. Shappell keep up the great product lines, and customer service! Rated 5 out of 5 by cjster from good quality for the money Been using this now for a couple of years. Sets up fast and goes back in the bag easily. Can hold 3 people, but works better with 2. Wish it were a little taller. [my friends and I are all over 6feet tall] but it really hasn't been an issue. Heavy duty fabric has stood up well even in below zero conditions with wind. Rated 5 out of 5 by Hardwater Bob from Quality shack Order 4 extra ice anchors for sides.1st use was in low single digit temps, sunny, and wind gusts to 25mph.Very stable when properly staked down.Dark when you want it, 6 windows when you need light or remove for extra ventilation.One man set-up in less than 4 min. Very good materials & design.Recommended ! Rated 5 out of 5 by Chad911 from Great Shack Easy to set up, take down and comfortably fits 3 adults. We have fished with 4 but it was a little tight with that many people. Stood up very well to windy conditions as well. My buddy heater keeps it nice and warm so we can fish without jackets on. Would definitely recommend. Rated 5 out of 5 by deadduckflying from Great Hut! This ice fishing hut is well built, easy to setup and take down. It is lightweight and comes with a nice storage bag with padded shoulder straps. It does a very good job of keeping the wind out and the heat in. Recommended! Rated 5 out of 5 by Outdoors woman from Awesome shack I purchased this shack and am very pleased with it. Plenty of room for 3 fishermen. Sets up in 2 minutes which is great when you are out in the cold. Lots of light blocking for jigging inside. Very pleased with the shack and it's price! 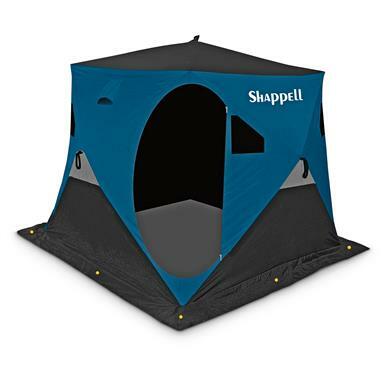 Rated 5 out of 5 by NHaven from Shappell Wide House I did my homework on this one - although it was priced less than similar shelters this one had consistently better reviews. After several outings I am in complete agreement. Well made - easy to set up and super comfortable. The only reason it gets a 4Star for quality is that the plastic tension slides are about worthless, S hooks take care of that problem in jif. I would also recommend purchasing at 4 if not 8 extra ice anchors if you plan on fishing windy days. Rated 4 out of 5 by Craig D3 from Out of Box Review Out of the box the shelter looks good. Material is durable, zippers seem to be heavy duty, and set up and take down was easy. This is a good thing specially when trying to do in the wind. Comes with four ice anchor, I feel you need at least two more. It was also easy to get back in the carry bag.Great buy.Plan note I have not had the chance to use the shelter to date due to lack of ice on our lakes.